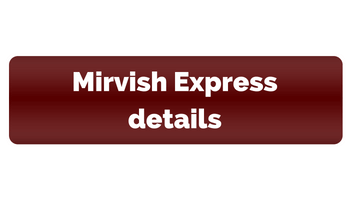 The Mirvish Express is a new bus service running from several locations in southwestern Ontario to the Mirvish theatres in downtown Toronto. 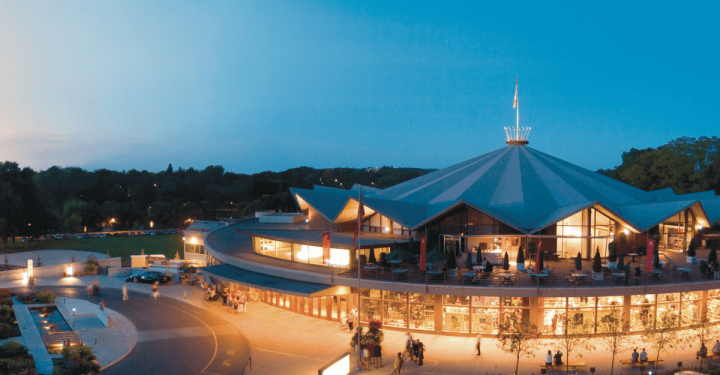 With great shows on stage now such as “Come From Away,” “Mamma Mia” and “The King and I,” not to mention upcoming shows including “Forever Tango” and “School of Rock,” there’s never been an easier way to see world class theatre. 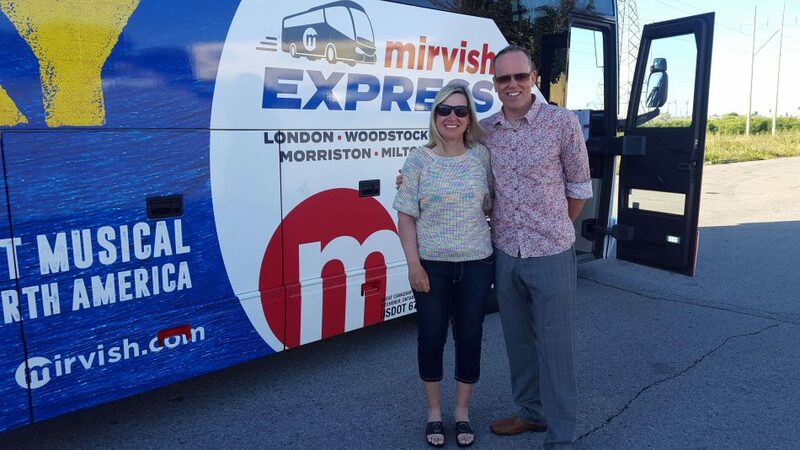 Suzie and I took the Mirvish Express to see “Wicked” at the Ed Mirvish Theatre. 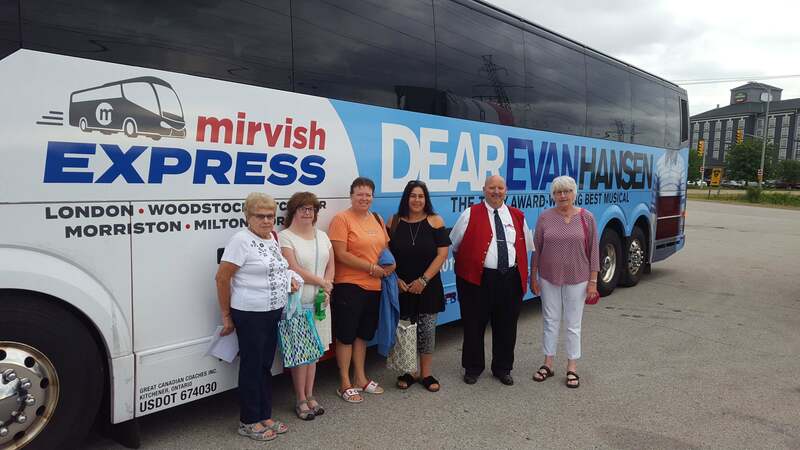 The bus ride to Toronto was a chance for us to spend time together without the hassles, and costs, of driving and parking in Toronto. Of course, we were not the only ones on the bus. We were joined by fellow theatre lovers, and our bus driver Tim. Tim has been driving buses for over 26 years and fondly remembered seeing his two favourite shows, “Phantom Of The Opera” and “Brighton Beach Memoirs,” in Toronto many years ago. Tim told me he enjoys meeting enthusiastic theatregoers on each trip. The wifi is excellent and the washroom was clean – yes I checked! I was pleasantly surprised by the number of parents with young adult children on the bus. The theatre can be a beautiful bonding experience between family members. The bus dropped us off right in front of the theatre: there’s nothing better than door-to-door service! 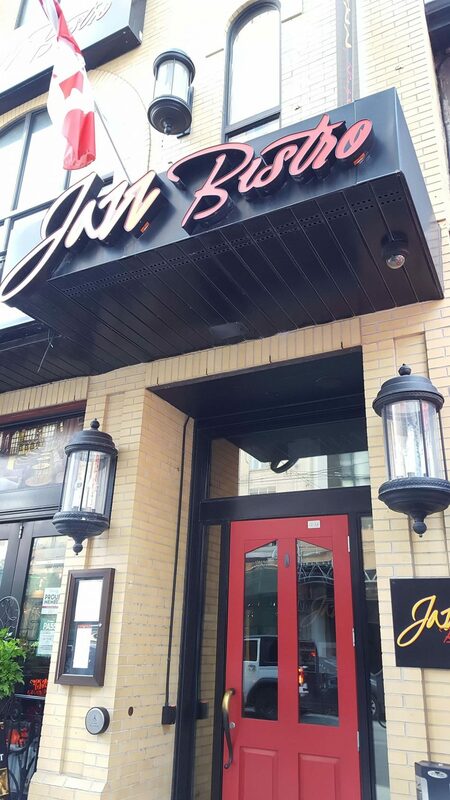 We arrived in Toronto with plenty of time for a gourmet meal right across the street from the Ed Mirvish Theatre at the Jazz Bistro. 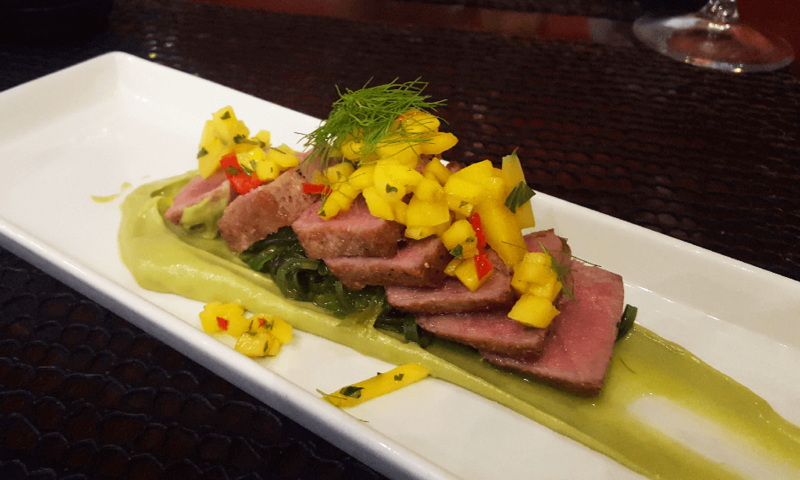 I had a delicious tuna with foamed wasabi and mango salsa. I paired it with the Appleby Lane Sauvignon Blanc, which was perfect. It brought the whole meal together. Suzie had the corned beef hash with asparagus and loved it too. 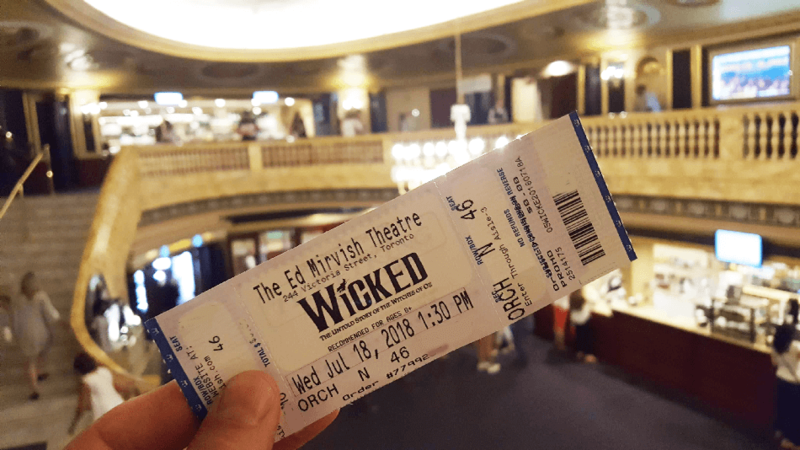 “Wicked” recently became the sixth longest-running show on Broadway, taking the spot previously held by “A Chorus Line.” The writing is sharp, witty and contemporary which is the reason we saw so many young people in the theatre. 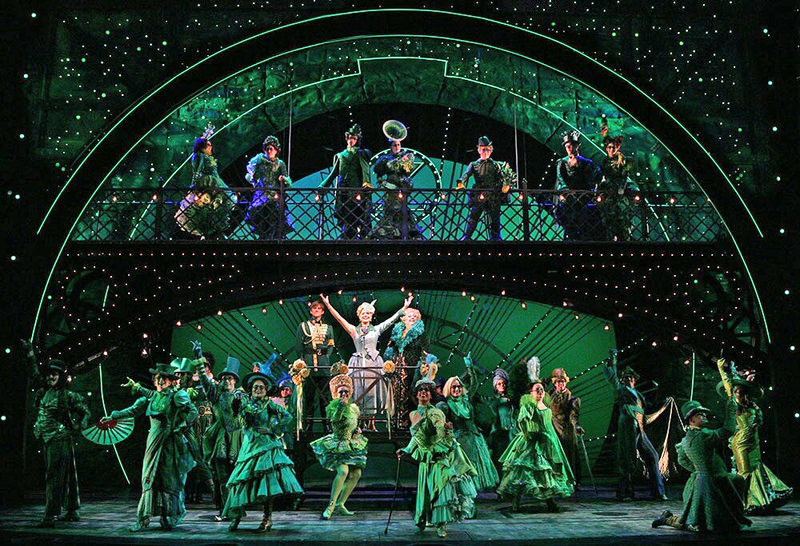 Eugene Lee, the set designer, first came to my attention from his work creating the sets for the TV show “Saturday Night Live.” Lee received a Tony award for his set design on “Wicked,” and his work truly transforms the theatre to a magical place. 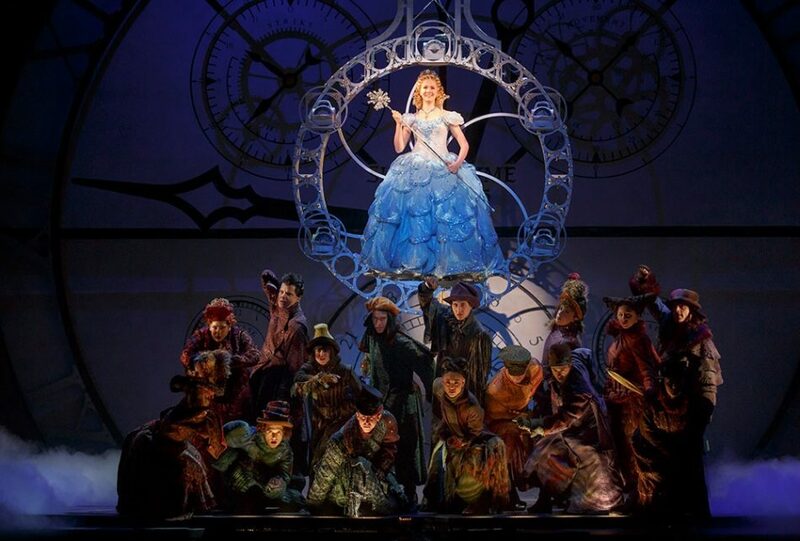 The spectacular costumes feature a thrilling steampunk flare that genuinely redefine the land of Oz. The multi-talented cast in this production make it a must see show. 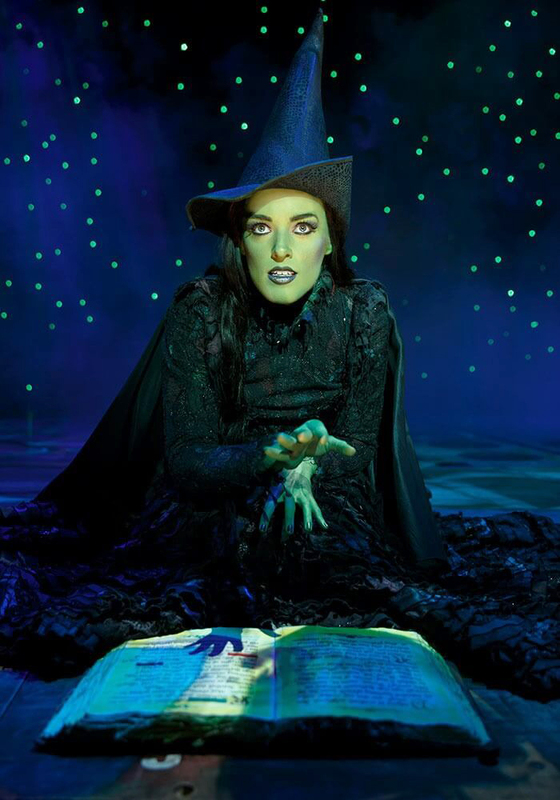 Mary Kate Morrissey plays Elphaba, the Wicked Witch of the West. Her portrayal of a character going through a journey of self-discovery is heartwarming and frightening all at once. Morrissey’s powerful voice tackles the songs, including the showstopper “Defying Gravity,” with a confident ease. Ginna Claire Mason, who plays Glinda, won me over with her comedic timing, channeling Renée Zellweger and Reese Witherspoon. Add to that her angelic voice and there’s no doubt Mason has a long career ahead of her. 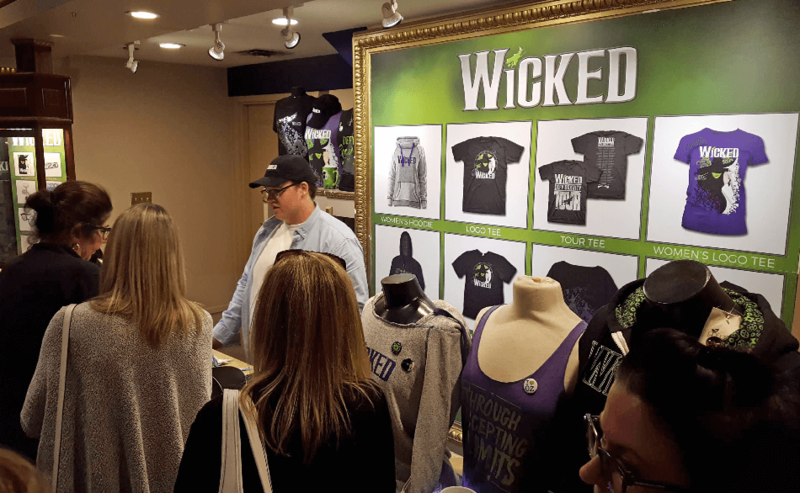 At intermission, there was a long lineup for the merchandise table, so if you’re thinking of getting a T-shirt for a friend who couldn’t make it be sure to get there early. 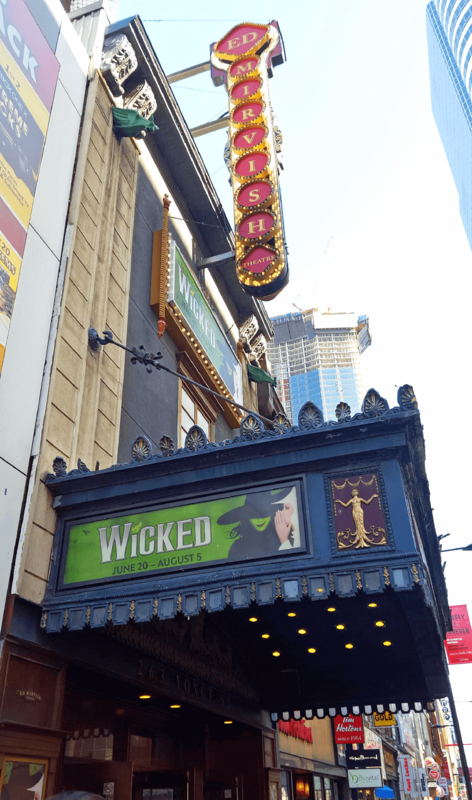 The Mirvish Express leaves the Ed Mirvish Theatre at 5 PM, so we had time to visit the Eaton Centre across the street. The food court downstairs has a fantastic array of international cuisine; don’t miss the chance to grab something tasty to go. We were back in London by 8 PM, and both agreed it was a wonderful way to spend the day that left smiles on our faces! 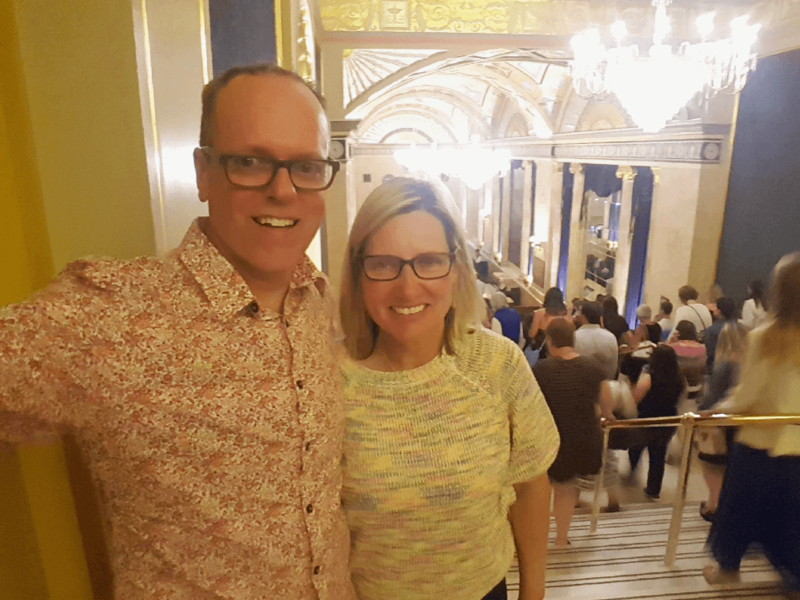 Come From Away – to April 28, 2019. Ain’t Too Proud – October 11 to November 17, 2018. Forever Tango – November 6 to 11, 2018. Roald Dahl’s Charlie And The Chocolate Factory – November 20, 2018 to January 6, 2019. School of Rock – November 28, 2018 to January 6, 2019. 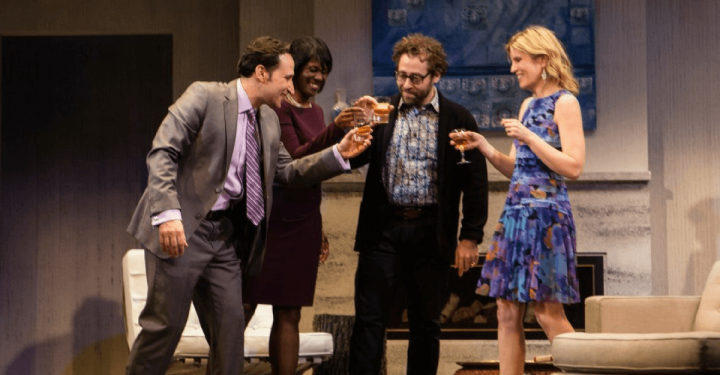 The Play That Goes Wrong – January 8 to February 10, 2019. 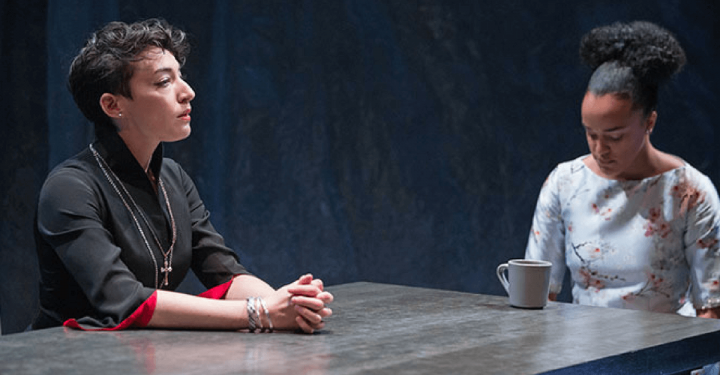 The Last Ship (with Sting) – February 9 to March 24, 2019. Wednesday, Saturday or Sunday matinees. Departing from London, Woodstock, Kitchener, Morriston and Milton.